Imagine if Miss Frizzle, science teacher extraordinaire, and the Magic School Bus really existed. We could all shrink down to the size of microscopic particles, fly up someone’s nose and enter their brain to investigate the inner workings of the mind – all in IRB-approved fashion of course. It certainly would help us in our attempt achieve the primary goal of biological sciences, which is to understand organisms in their most natural state of function. Since there are no magical shrinking automobiles, in order to see inside the brain neuroscientists have to be able to label structures AND let light reach them to capture an image. 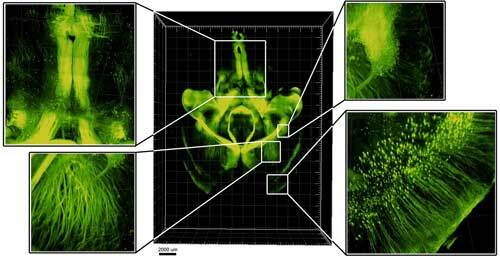 One major branch of the existing techniques used to understand the brain’s structure involves cutting the brain into incredibly thin sections (40 um – 200 nm thick), which are then labeled with molecular markers and then reconstructed into 3D images. These studies are often limited to very small tissue volumes because the brain contains opaque lipids. Lipids are a group of molecules that include fats, waxes, fat-soluble vitamins, and phospholipids. Phospholipids form a continuous barrier around every cell in the body, with their hyrdophillic head (water-loving) and a hydrophobic tail (water-fearing) they band together in a ‘tails in – heads out’ formation to create a lipid bilayer. Within tissue, lipids are important for shaping cells and holding molecules in place, but their presence has been a major barrier in fluorescence microscopy that up to this point has been difficult to address. Lipids limit access of fluorescent molecular labels to their targets and scatter light photons resulting in blurred images. Karl Deisseroth and his team at Stanford realized that if lipids could be removed they could achieve higher quality images of brain tissue and thus pioneered a new technique they named CLARITY. Kwanghun Chung et al. (2013). Structural and molecular interrogation of intact biological systems. Nature 497: 332–337. Click HERE to go to this article. CLARITY allows light and molecular markers to reach targets within large tissue volumes all while maintaining the tissue’s natural structural landscape. How is this accomplished? Essentially the process involves infusing the tissue with hydrogel monomers and formaldhyde, a fixative that links proteins in the tissue together. The formaldehyde also binds the hydrogel molecules to biomolecules present in the tissue, importantly keeping everything in place. Next the hydrogel monomers are actively polymerized, which involves the small molecules binding together to create larger chains that form a mesh. Once the mesh is in place an electric field is created across the tissue, which forces the lipids out of the sample. The result is a see-through brain that can be easily labeled with molecular markers. For an entire mouse brain this process only takes about 8 days. But the technique is not limited to mice or even just brains. CLARITY will work on any organ. One important question for anyone involved in translational neuroscience is will CLARITY work in human tissue that has been stored in fixative for years on end? Deisseroth and colleagues investigated a thick block of frontal lobe tissue from an autistic patient that had been in storage for over 6 years. Not only were they able to successfully label and image the tissue but they also made some fascinating observations. Within the tissue a particular class of neurons, parvalbumin interneurons, that are thought to regulate synchronicity of network neuronal firing showed neuronal structures wrapping around and connecting back to themselves rather than other neurons, a phenomena not normally observed in subjects with healthy brains. This is just one example of how CLARITY is blazing a new path for acquiring previously unobtainable information about structural and molecular systems in the human brain. What’s the most exciting news about CLARITY for this graduate student? It means I might regain feeling in my fingers because tissue sectioning on the cryostat may have just become obsolete!